It's only hitting home now, that we were so lucky to have him on our team. Yes, it was and still is a bit cliché, to say that "Brian O'Driscoll is the best player for Ireland" but he actually is ? Think about his record, captaining his Country, his Province and the British and Irish Lions. Only somebody with a significant talent and gift would be able to achieve this ... As a player he is by far one of the most intelligent and wise players to have played for Ireland, his ability to read the game was second nature to him, being at the right place at the right time was his forte. At times he came in and out of games, but even then he was picking his moments, often coming out on top at heroic moments, having him save the day again and again for his team. It's sad to see him go, maybe not now but it will happen. And my guess is that it'll be when he plays another fantastic match, to go out on a high note, to make it all the more dramatic. He served his country well and is a role model to us all. 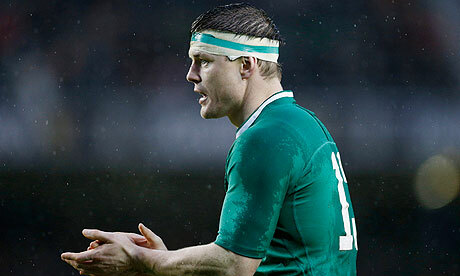 He as a person is fantastic at persevering, during the 2013 Six Nations campaign, he sustained a concussion,a double head wound and an ankle injury (source; the Irish times) all in his part for his country. He is not only a persevering-heroic-genius-inspiration, he is a genuine down to earth man and that's what separates him from the football superstars. Personally when seeing him pass in the street he has always had the courtesy to smile or talk back to you and that's why in my opinion he is somewhat the people's hero. - And If your reading this Brian, which you probably won't, when and if you have a son, tell him there's no pressure.